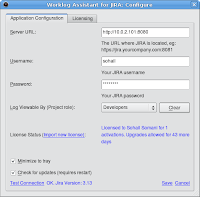 A new release of Worklog Assistant is available. I'm tempted to call this the "Ugly Betty" release because the UI has been completely redone to better support expectations. However, that would be a disservice because there are many changes that have gone into this release. Last but not least, there have been some performance improvements made on the JIRA plugin. If you are using our JIRA plugin for Worklog Assistant and are experiencing performance issues, please update to the latest plugin. This should fix your issues. As always, if you have any questions, suggestions or issues, let me know.